Jacky started on motorcycles then turned to saloons in 1965, twice winning the Spa 24 Hours. However, he caught the eye of Formula One team boss Ken Tyrrell who put him into his Formula Three team. Jacky was fast straight away, but his Matra lacked reliability. Tyrrell promoted him to Formula Two for 1966. He won three races in 1967, even having the audacity to qualify third for the German Grand Prix when pitched in against more powerful Formula One cars. 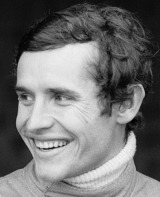 Running fourth in this race before his suspension broke ensured that he was promoted to Formula One for 1968, with Ferrari. He was fourth overall in his first season, winning the French Grand Prix. He moved to Brabham in 1969 and won twice more, also winning the Le Mans 24 Hours, yet there was nothing he could do to keep the title from Jackie Stewart. Back with Ferrari in 1970, he won three times, but was second again. Three more years with Ferrari became ever more frustrating as the Italian cars were no match for the cars from Tyrrell and Lotus. He joined Lotus for 1974, just as that team's fortunes started to slide and Ferrari's improved. The twilight of his career was spent with Williams, Ensign and Ligier, leaving Jacky to draw satisfaction from his record tally of six wins in the Le Mans 24 Hours. He has since been involved with the modernization of Spa-Francorchamps.